The No. 1 ranked Winner football team scored 44 points in the first quarter on their way to a 60-6 homecoming victory over Chamberlain Friday night. The game ended at halftime due to the mercy rule. The Warriors are 5-0 for the season. 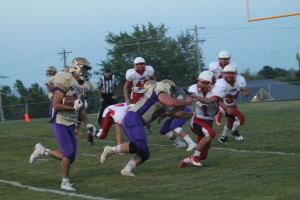 Winner has a bye week and will not play again until Oct. 7 when they travel to Parkston. “This is a good time to have bye week as it give us extra time to prepare for Parkston,” said Aaker.